It really breaks any dog owner’s heart when two of his dogs do not get along. 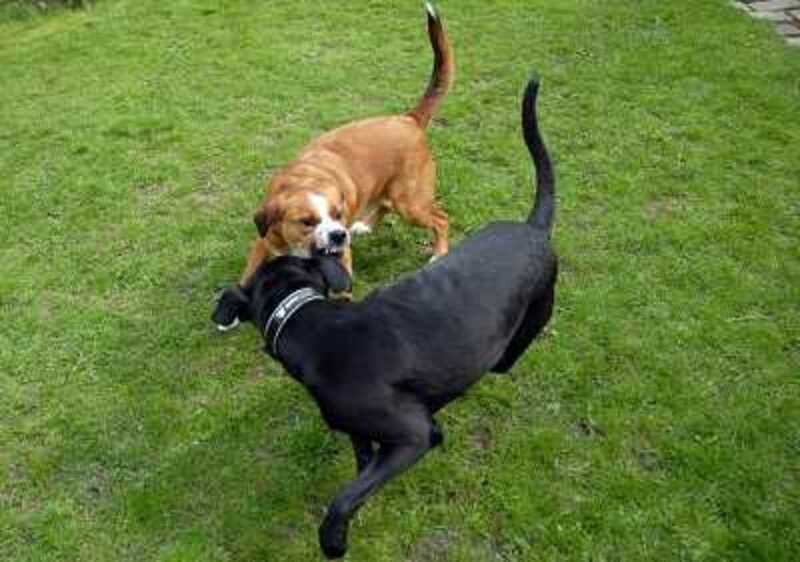 Dog fights may be simple “discussions” between dogs without any bites involved but likely, they have the potential to escalate to ferocious fights that can in some cases even turn fatal. The causes of fights between dogs can be various but the most common seem to be dominance related. The most severe fights surprisingly appear to happen between two female dogs. Male and female dog combination seem the most likely to get along. And surprisingly again, it seems that most fights occur in the presence of the owner. The typical dog fight occurs when one dog perceives the other dog as a threat either because the other dog invaded his space, ate food first, got petted first, entered a door first or got a hang of his favorite toy first. Aging is a common cause of fights in multi-dog homes, this occurs when you own an elderly dog and a younger dog. A fight is picked up when the younger dog starts challenging the elder’s dog position in order to try to change the pack order. This occurs especially when the older dog starts exhibiting signs of aging, weakness or sickness. In nature these fights are pretty common as they help determine the position of the pack. It surely hurts for the owner to see their loving dogs suddenly turn aggressive towards each other especially when the fights turns bloody. It is vital that the owner use extreme caution when separating two fighting dogs. Even though the owner may blindly trust its two dogs, the dogs may exhibit redirected aggression and mistakenly strike him/her. It’s a shame when this happens because the owner in truth had only good intentions to protect the pets. In order to avoid this for future reference the owner can separate the dogs by spraying them with a hose, or by tossing a blanket over them to confuse them and hopefully stop the fight. A loud noise may also startle them for a few seconds. Another method is to have a helper and grab each dog from the rear legs in a wheel-barrow fashion dragging the dog away from each other but being careful that the dog doesn’t turn around and try to bite. In order to lessen the chance of future fights there are some things that can be done, however, fights may reoccur if dogs are not monitored and/or they are not stopped before they progress to ferocious biting. The owner must establish that no fights are tolerated in your household. When your dog begins to show signs of an imminent fight (growling, barking, aggressive posture) you will need to train your dogs to listen to you when saying in a firm voice “Stop it” or “Leave it ” or whatever wording works best for you. It must be clear to your dogs that fighting will not be allowed and you mean business. You can start out by having the dog that picks up fights on a leash so you can re-direct as needed. Repeat several times and then try as safely as possible without the leash. Be prepared with a water hose or blanket if the fight gets off hand. Have a helper nearby. Making a loud noise with two pot lids may make a noise that’s loud enough to distract the dogs. Letting your dogs wear a “tab” a short leash with a handle can help you move the dogs right away if need be. However, it is best to keep the fighting dogs separated for a while, especially if you are not able to monitor in order to avoid injuries. However, in some cases dogs may never get perfectly along as before. At this point you may think about obedience training, contacting a dog behaviorist, keeping them in separated areas permanently or giving one up. Even though this last solution may seem a bit extreme and heart breaking, if you are unable to permanently keep them separated, it is the best solution to grant your dog’s wellbeing and safety. After all, in the wild these dogs would leave the pack and wander around until they are accepted in another pack.